All 7 flesh tones of Authentic Reborn paint. Do not use thinner with these paints! Each petite jar comes with 5 grams of paint. Authentic Reborn brand flesh tone paint set comes with 7 skin tones in a petite size to match any ethnicity. Why get the more expensive big jars of paint when you only need a little to make your reborn babies? 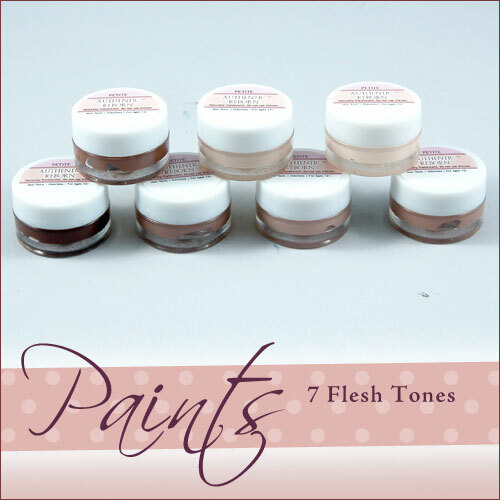 This set comes with all 7 of the heat-set flesh tones from Authentic Reborn. You can make up any skin color you like from any cultural group in the world. What darker skinned babies have you thought about making but didn't have the needed colors? People have multiple shades of color even within their own ethnic group. Now you can match any skin color that may be needed to make that very special baby for someone. This set includes Flesh 02, 03, 04, 05, 06, 07 and 08.